I will allow that it is an especially heavy frost. I like waiting until my pumpkin looks bad or has snow on it to put it on the compost pile. I know it is a little weird. I like seeing a pumpkin on the porch in fall and tossing the beast after Halloween removes the best part for me - the run-up until New Year's. I like coming home in the dark and seeing the beast. I know there is no good explanation for this behavior. I seldom have guests to our little hill and so no spousal ire is invoked most years. This one just happened to work out quite well. I had this little treat this morning. The last several days have seen more work on my part about writing than in the actual crafting of text. That changes in the morning. I have a pretty good rough edit of changes to make to a little slice of a story which appeared earlier on these pages. It isn't important enough to backlink so don't think I just missed that inclusion. I actually think that this little slice might be able to do the job as a stake in the ground for a long-form work when combined with another of my short pieces. I still would need to do some fairly heavy plot outlines to get a novel out of the germ. I suspect I might try. So, some serious work in the morning still following the premise of simple dialogue attribution, few adjectives, fewer adverbs, and a serious focus on character based tension and conflict. If I can get the internal struggle realized outside the character using little description, I'm on the right track for a first draft. 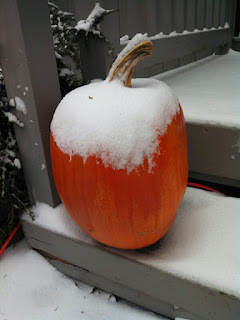 Holding onto this story has been something like the pumpkin in the picture. It didn't serve much purpose. It still had some appeal to me even though its season was clearly past. I chewed on the idea for a while and grew to sense a flavor I had overlooked. Now, back to it and a little work to see what I can find. I had this lovely surprise this morning. Maybe I'll find something else in the frost tomorrow.